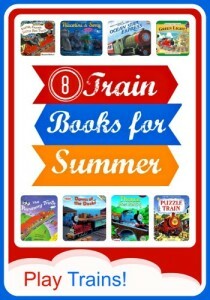 I’m excited to be joining 25+ other fantastic bloggers from the Kids Blogger Network this week to share our Top 10 Learning Lists for Summer. 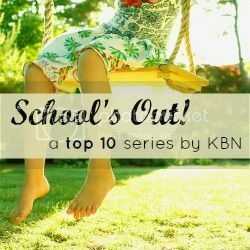 You can see the full list of topics at School’s Out: a Top 10 Series by KBN, or follow along on the School’s Out Pinterest Board. The Little Engineer’s preschool let out for the summer last month, and we’re both enjoying the freedom to stay home more and indulge in the kind of play that takes over entire days. As nicer weather flits in and out of our area, we’re taking it outside when we can, but one thing remains constant: trains, trains, trains! 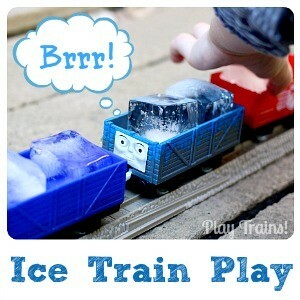 Fortunately, there are plenty of ways to learn with trains while we’re having fun and playing! Here are ten of our favorites, perfect for summertime. The Little Engineer and I love acting out the books we read. One of the most satisfying ways to do this for a train book is to build a track layout based on the book and play the story. Over time, we’ve become more and more organized about the way we plan one of these layouts — the most recent one we did reminded me very much of putting on a play — and it’s a great way to teach kids about the elements of stories. 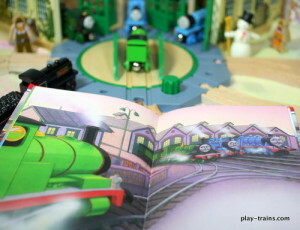 Check out our book-inspired train layouts for Thomas Gets a Snowplow and Valentine’s Day in Vicarstown, and keep an eye out for more coming this summer. 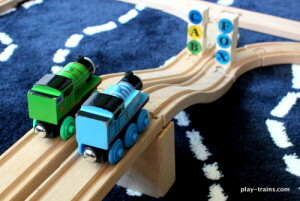 Wooden train tracks occupy an interesting space between the metallic, manufactured prototype they emulate and the natural, organic material they are made from. 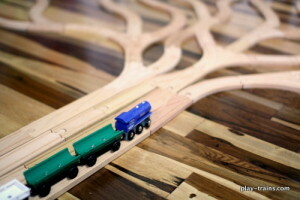 One of our favorite activities we’ve done, Learning About Trees with Wooden Train Tracks, explored that connection while also providing lessons in the basic parts of a tree, and in planning and executing a project. This summer, I’m planning to take this activity outside and recreate our “Tree Track” beneath the boughs of the big beech tree that shades our deck. Toy trains — especially the bright and colorful Thomas & Friends engines — are perfect objects for helping children learn their colors. 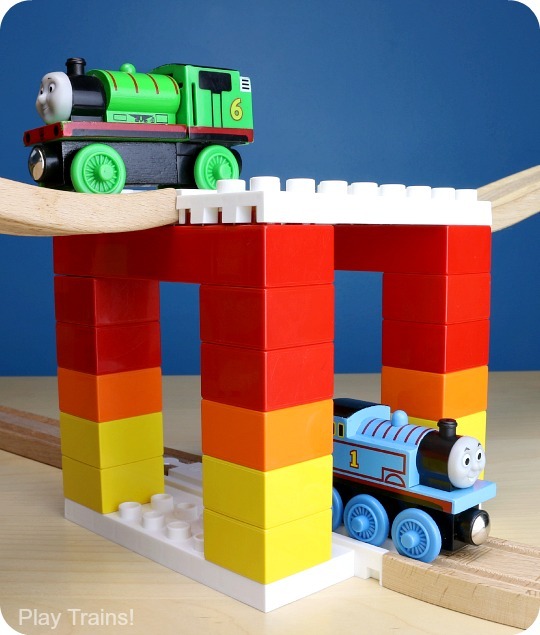 I attribute the Little Engineer’s early interest and knowledge of colors to the rainbow of trains he played with as a toddler! Our Engine Paint Shop train color matching activity can be made to work for older children by focusing on finding a shade that exactly matches each engine’s paint work. Other than hearing the stories he comes up with, the thing I love most about making books with the Little Engineer is how personal they are. We’ve written books based off of his favorite trains, stuffed animals, movies and TV shows, bedtime stories, and activities (the one about how we make smoothies is always popular). The best books are the ones where we’ve combined two or more of those elements and created a story no one else could — or would! — have ever written. 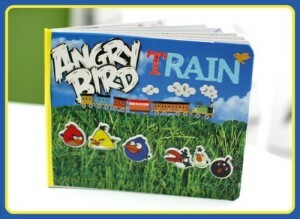 Recently, we worked together on Angry Bird Train, a book that both of us are happy to read over and over again, and one that I’m quite sure will be a cherished childhood memento. 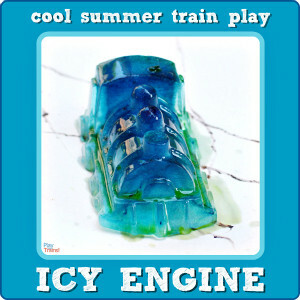 Freezing toy trains in ice presents an opportunity for both scientific exploration and problem solving…plus plenty of motivation to keep at it until the trains are rescued! Here in Seattle, summer doesn’t mean an end to rainy days! Whether the weather that drives you inside is wet or excessively hot, Railroad Word Crash is the perfect activity to focus some big energy in a positive direction or pull a kid away from screen-based entertainment. As several readers have noted, you could adapt this activity to practice so many different subjects: crash the answers to math problems, crash foreign language words, or crash letters with the littlest engineers! If your child is also an Angry Birds fan, our Angry Birds Space Letter and Word Crash is particularly fun. 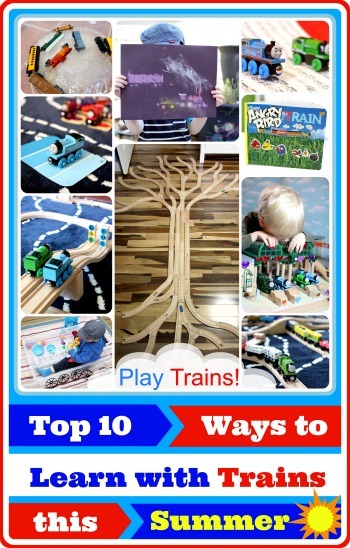 Of course, if crashing isn’t your little engineer’s favorite aspect of train play, you could try our Word Family Freight Yard, which focuses more on trains doing useful work. 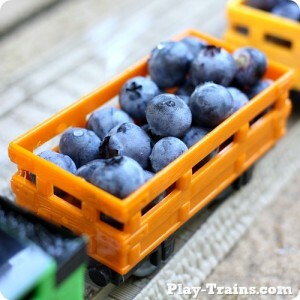 Dice Cars — the Little Engineer’s favorite train math game — would be a great candidate to play outside in the shade, gathering natural materials to use as freight in the cars. 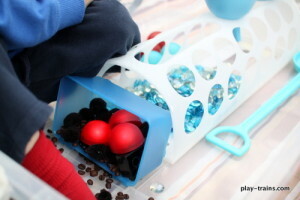 This is another activity with plenty of variations for different skill levels. Summertime often means road trips, or at least longer car rides on the way to somewhere special. 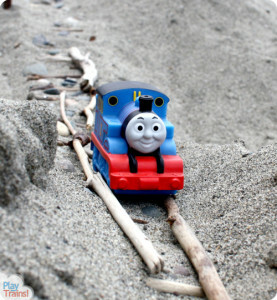 “Classical Train Music”, our activity for encouraging a love of music through a child’s favorite things, was something I came up with in the car, and that’s where the Little Engineer most often returns to it. 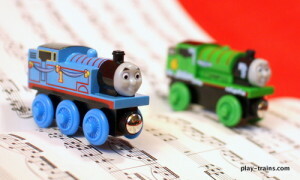 In the months since we started interpreting music with trains in this way, his interest in music has really blossomed. It’s fun to see him starting to create music that’s intended to convey a certain mood or emotion. 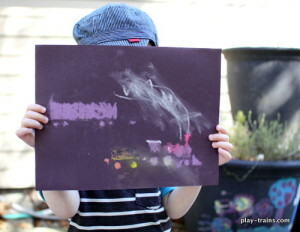 The Little Engineer only stops pretending he’s someone or something else when he’s very, very upset, so pretty much any activity we do tends to have an element of imaginative play to it. But when we set up a very involved pretend play scenario, I’m always amazed at how many different things he seems to be learning all at the same time. 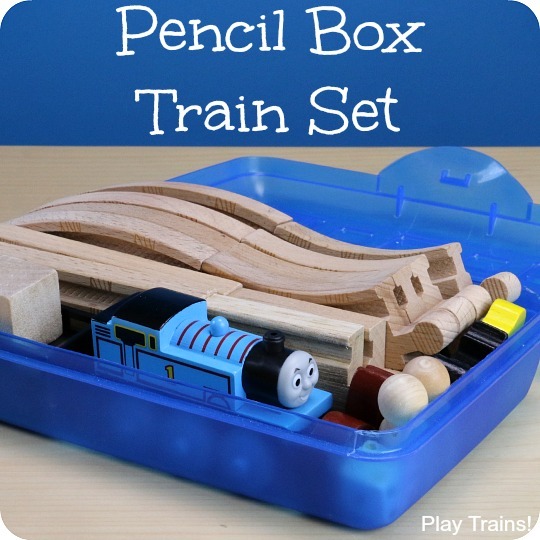 A few of our favorite pretend play games are Coal & Water Steam Engine Sensory Bin, Monorail Ticket Booth Pretend Play, Puzzle Train Ticket Mix-up, and BIG ENGINE: Train Pretend Play. 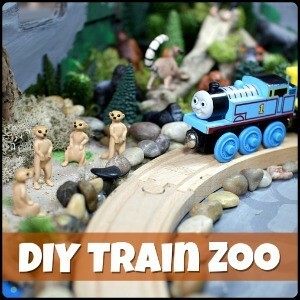 So many great ideas and a wonderful resource for little train engineers! The trees made with tracks is one of my favorites. Thanks! The tree track is still one of my very favorite things we’ve done. I’m contemplating buying some extra track to turn into wall art. 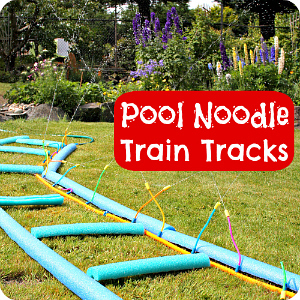 My oldest was train crazy when he was younger and would have loved these activities. Thanks for sharing them at the After School Party. 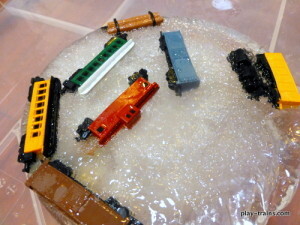 I totally had to laugh at the frozen trains–I think my 3-year old would be very worried to find his trains stuck in ice! It could lead to some wonderful problem solving! I’m so glad you shared this at Teach Me Tuesday at Preschool Powol Packets!! I’m loving the train ideas! Thank you so much for sharing! I can’t wait to use them next time we do our transportation unit. 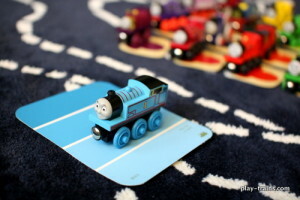 We have many Thomas & Friends lovers in this house! Feel free to check us out at http://everystarisdifferent.blogspot.com. Reading practice by crashing trains? That is awesome! 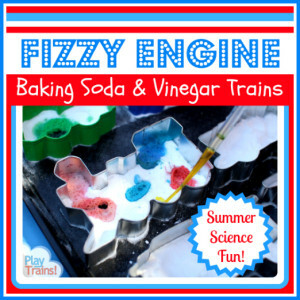 This blog post is chock full of great ideas to leverage a child’s love of trains to increase learning a variety of subjects. Thanks for sharing at the After School Linky Party!